There’s something about French artist Didier Hamey’s figures—or perhaps it’s better to call them entities—that’s a bit mystic. These beings, on display at Phylogeny Contemporary, seem to inhabit several different planes all at once, taking forms that blend leaves, animals, and human heads to create something almost outside recognition. The truth is, these figures don't come from another planet, but are inspired by the characters that appear during Carnival celebrations in the north of France and Spain. The tradition of Carnival runs deep in Dunkerque, anglicized as Dunkirk, where Hamey grew up. “Being born in Dunkerque means being born to carnival, festivals, music, dance, weird little personae, amusement, feast,” Hamey says in his artist statement. This celebration that harkens back to the 17th century, when men went on a 6-month fishing journey in Iceland unsure if they’d survive the treacherous voyage. Carnival provided the perfect opportunity for fisherman and the greater Dunkirk community to revel in the carnal and earthy delights of this pre-Lent time. Drinking, parades, dancing, people dressing up in elaborate masked costumes—anything goes. During a one-year residency at the Casa Velasquez in Madrid, Spain, Hamey became aware of an entirely different tradition of Carnival and thus a whole new host of characters, mostly from Basque Country. Partly riffing off these European Carnival traditions and partly in homage to French Symbolist painter Odilon Redon, Hamey then created a series of 30 drypoint prints, what would become Les Bonshommes. Hamey's figures are haunting and dreamlike, culling together aspects of different Carnival characters. Like Momotxorro, based on a Basque Carnival costume whose suit is made of found cans that rattle loudly when moved, the sound meant to keep out witches. In his version, Hamey substitutes the cans for bunches of flowers, rendering the character much more delicate. Or Irritsua, another Basque character, which Hamey depicts in a lush forest background with a scary mask and body made of hectic scratches. 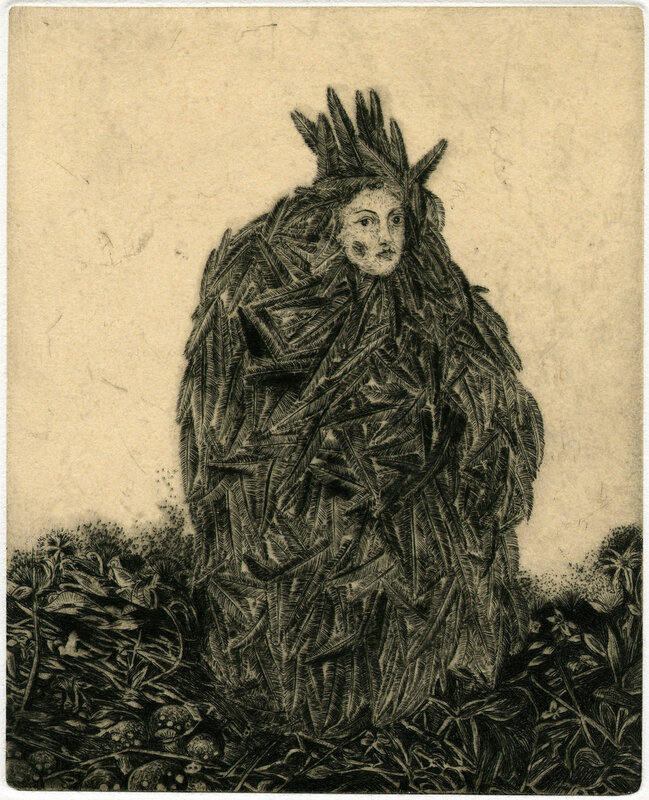 This is a print that immediately reminded me of the opening scene of the art-horror film Begotten, where a masked figure is stabbing itself and bleeding out in the corner of a room. Perhaps it's not the most accurate comparison, but the unsettling feeling I got watching that film feels similar to what some of Hamey's characters evoke in me. Co-curator of the show, Sophie Lefebvre Blachet, assured me that Hamey didn't intend for these figures to be scary, that they are just an exploration of a concept that the artist is fascinated with. But I think that a combination of fear and fascination are what makes Carnival characters so compelling. When I lived in Galicia, a northern region of Spain, for the last two years in a community with a strong Carnival tradition, I was terrified of the men dressed up as medieval tax collectors called cigarrones. In their masks with their small beady eyes and a permasmile, the cigarrones ran around Carnival celebrations whipping partygoers, the bells that were harnessed to their belts loudly signaling their arrival. People would scatter, screaming with a mixture of terror and glee, spilling their drinks trying to get out of the way. I think this terror inflicted upon people celebrating Carnival is meant to remind people of the solemn 40 days ahead. Les Bonshommes is scary, fantastical, and strange. The amount of detail Hamey packs into such small prints is impressive—if you scooch up close you can almost see the feathers on the characters gently flutter in the wind. The opening reception is tonight at 6 pm and the prints will be up at Phylogeny Contemporary until Feb. 16th.